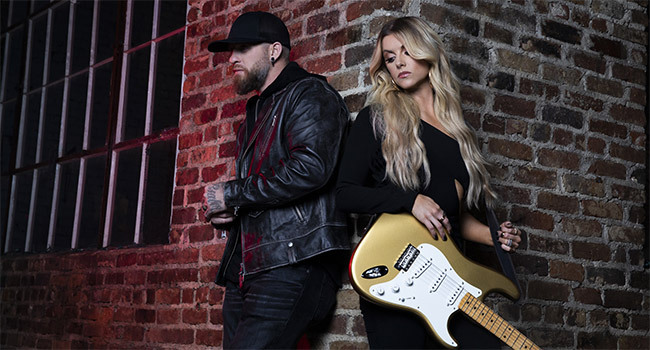 Brantley Gilbert has teamed with Lindsay Ell for a new single that’s heading for country radio. “What Happens In A Small Town” pairs the South Georgia native Gilbert with the Canadian multi-instrumentalist Ell that captures the fury of love where you find it, its inescapability and the reality of living with memories or fixing what happened. With an echoing chorus of “What happens in a small town/ Stays in a small town/ Every back road we’ve ever gone down/ Friday night bleachers, Sunday pews/ Ain’t a county line mile without a memory of you…” unfurls into the wreckage and reclamation of love that refuses to die. Written by Gilbert, Brock Berryhill, Josh Dunne and Rhett Akins, “What Happens In A Small Town” (The Valory Music Co.) was produced by noted hard rock guitarist, three-time CMA Awards Musician of the Year and two-time ACM Awards Producer of the Year Dann Huff (Keith Urban, Megadeth, Midland, Kane Brown). Finding the truth in the pain is everything. For Gilbert and Ell, it sets the stage for so much music to come. And on December 14th, the song arrives at country radio – ready for the world to consume, with an add date of January 14th. Gilbert’s unflinching take on real world country has seen him build a back-to-back platinum fan-base with an unflinching consideration of life on life’s terms. With six No. 1’s – “One Hell Of An Amen,” “Country Must Be Country Wide,” “Bottoms Up,” “You Don’t Know Her Like I Do,” CMA Awards Song of the Year nominee “Dirt Road Anthem” and “My Kind of Party” – and an unrelenting live show that coalesced the BG Nation, he’s very committed to maintaining a high level of truth, passion and intensity to his music. And it would take a woman of equal passion and intensity to go toe-to-toe with Gilbert in the studio. Enter Lindsay Ell, the vocalist and multi-instrumentalist whose fearless approach to rocking country is making her a force to be reckoned with.